The immediate aftermath of a fire is a confusing time. There are so many things that need to be done right away and you hardly know where to start. Forgetting something can often lead to more trouble in the future, so make sure you check these FAQs so you know what to do if you find yourself dealing with fire damage. Q: What can I clean on my own? A: It’s frustrating waiting around with all that devastation in front of you, but most people don’t have the training, equipment, or cleaning products to deal with the situation. Trying to clean something by yourself can have the opposite effect and ruin something that could have been salvaged by an expert. While you wait for a restoration team to arrive, sort through items as much as possible and set aside items that should be considered top priorities for restoration. Fragile, expensive items such as computers and TVs must be restored sooner than everyday dishes. This will help the technicians know where to start when they arrive. Q: How long will restoration take? A: The length of time depends on the extent of the damage and the complexity of the restoration. A fire in a single room will take less time to restore than an entire floor, while a contemporary building that doesn’t have to comply with historical neighborhood codes or require hard to find replacement items will be completed sooner. Q: Will I have to move out during restoration? A: It depends on the extent of the damage. You won’t be able to stay in a home that has sustained extensive damage, lacks structural stability, or has no utilities. 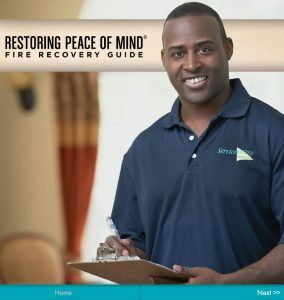 If the fire was contained to a single room, you may be able to stay, depending on the smell, the sounds of fire damage restoration work, and other concerns. Someone who works at home may not be able to deal with construction tool sounds and paint smells all day. Ultimately, it’s up to you and the restoration company. Q: What items should I keep with me if I have to leave after a fire? Important personal documents;Valuable collections, such as artwork, or coins. A: We prefer to restore items on-site as much as possible. Sometimes that’s not an option; an item may be too damaged, or the building may not be structurally sound enough to safely allow our employees to work there. In situations like these, we will carefully inventory any items we remove from the premises, and pack-out and transport them to our secure facility for restoration. Occasionally there are high-value items, such as artwork, that require the services of a dedicated specialist for restoration. In these situations, we’ll work with your insurance company to find a qualified specialist to take the project. Q: Will I have access to my items if they’re at your facility? A: Of course! We realize sometimes you need access to documents, clothing, and other important items, especially when dealing with a disaster like a fire. Sometimes it happens that the items you need are being stored in our secure facility. With advance notice, we can schedule one of our helpful technicians to help you access your items quickly and efficiently. A nominal service charge may apply. Q: I have to inventory the non-restorable items for the insurance company. How do I do that? This helps the insurance company estimate your losses for the claim. It’s important to remember all your losses after a fire, even for small things like dishes and toothbrushes, because you need all of these items and they need to be replaced. Be sure to keep a copy of the inventory for yourself. Q: When is it safe to turn on the furnace/air conditioning again? A: Never turn on the furnace or AC until it’s been thoroughly checked by an HVAC technician. The system could have been damaged by the fire without your knowledge, and using it can cause new problems. You also want to be sure the system won’t pump soot and smoke through your home. Nobody plans to experience a fire, but it’s important to know what to do afterwards, just in case. One of the most important things to do if there’s a fire at your home or business in the North Shore or Chicagoland suburbs is to call ServiceMaster DAK. We provide fire damage cleanup and smoke damage restoration to clients in Northbrook, Wilmette, Glenview, Highland Park, Lake Forest, Winnetka, Buffalo Grove, Evanston, and surrounding areas. For over 40 years, our highly trained experts have provided comprehensive fire damage restoration services, including odor removal, water and structural damage restoration, and more. We’re available 24 hours a day, 7 days a week to respond to emergencies any time they occur. We stop the spread of smoke, soot, and water damage to limit the devastation to your property. Fire and smoke damage restoration costs vary, depending on the extent of the damage. Watch the video for more information.